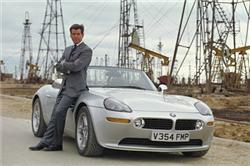 A John Cleese looking character then appears from underground - Beneath a snooker table in fact, that separates to reveal a man in a white coat and a rather fancy looking new BMW Z8. We will call him; Assistant Head of Operations, Q Branch, and he replies, “Ah yes, the legendary 007 with. Well, at least half of it. 007: “Oh yeah, new model. Improved specs.” As he is putting on a pair of erm, specs. We later learn that the vehicle has a key ring that controls the car remotely, an Infra-Red tracking system, rockets propelled from a launch system in the side panels, and a high-sensitivity listening device. Not much is seen of the car in the film, although as it didn’t really seem to have much scope for featuring in the production, it is unlikely that it affected the story too much, when BMW were only able to supply a prototype shell and a test vehicle. The studio prop team had to make their own kit cars for the film. They made two kit cars for the production and one of the surviving vehicle was on display at the National Motor Museum, Beaulieu, and is owned by Eon Productions. The other sold at the 50 Years of James Bon Christies Auction in December 2012 for £84,000. Approximately 5,700 Z8s were manufactured by BMW, with half of them sold in the USA for around $130,000 each. The purchase of a new Z8 also included some not seen before levels of customer service. Owners would receive a high-quality scale model of the vehicle, a hand-made book that included photographs of the car in production and paint and upholstery samples. Owners were also provided the option of taking delivery at the BMW HQ in Munich, where they could watch the final assembly detailing of their car. That was the 1999 price, which works out at around £85,000 today. You may have to pay more than that for the 14 year old vehicles at current sale prices on the secondary market. Driving experiences are among the most popular with the experience companies. 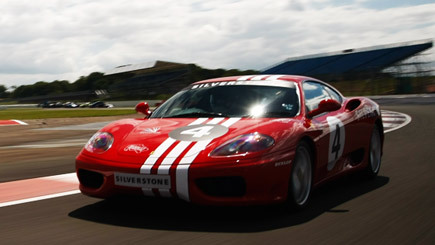 There are usually a variety of Supercars to choose from, including Ferraris and Lamborghinis. The best prices can be found by opening all of the website links below and checking the prices against each other.